After a recent trip to my parents’ place on the Bellarine Peninsula I sat at home trying to think what I could do with the beautiful freshly laid eggs they had given me. 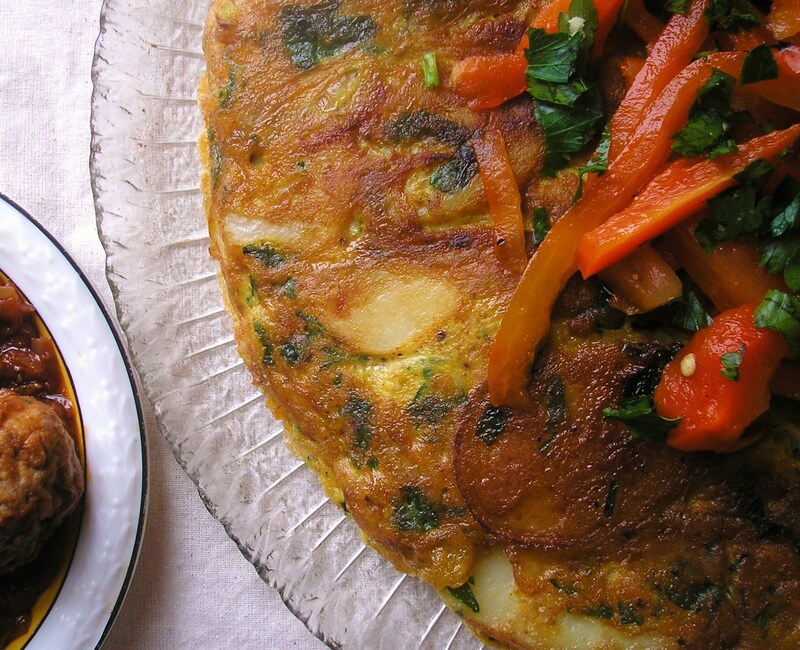 Tortilla de Patata or Spanish Potato Omelet seemed an obvious choice. When most people think of tortillas they think of the corn or flour tortillas of Mexico. Delicious though these are, the Spanish tortilla is different being more like an Italian frittata. Cut into small wedges it is a common dish in tapas bars throughout Spain and, indeed, the rest of the world. In its simplest form it is just potatoes, onions, eggs and plenty of olive oil. I added some chopped parsley and paprika for a bit of extra flavour. Other ingredients you could add are chopped cooked chorizo, chopped roasted red peppers, chopped pitted olives – the possibilities are endless. Just remember that the potatoes are supposed to be the feature of this dish. To go with the Tortilla de Patata I made another common tapas dish. 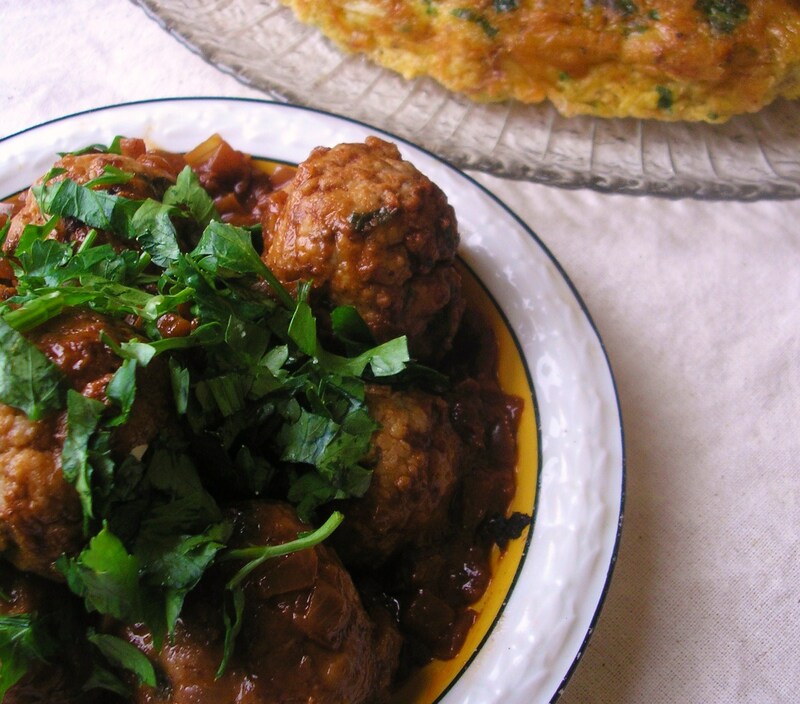 These tasty little meatballs in a rich, red wine sauce are called Albondigas. In a tapas bar four or five of them would normally be served, as a snack, in a little flat earthern ware bowl. If you wanted them as a meal you could serve a few more of them with a wedge of Tortilla de Patata and a salad. Cut the peeled potatoes into slices about 3-5 mm thick. Season. Halve the onion and finely slice. Set aside. Heat about a 1/2 cup of oil in a large, heavy based frying pan over medium heat. Not too hot! Gently cook the slices of potato in batches adding the onions with the last batch. Try to make sure the potato slices are covered in the oil. The potatoes are not meant to be brown, just cooked through and tender when pierced with a fork. Remove and drain. Whisk the eggs with the parsley, paprika and salt and pepper. Add the potatoes and onions and mix well to make sure all the slices are coated in the egg. Heat 2-3 tbs olive oil in a heavy based or non stick pan. Use a pastry brush to oil sides of pan. Pour in the potato and egg mixture making sure to spread it out evenly. Allow the egg the cook around the edges then carefully lift the side of the tortilla to see if the bottom has browned. When brown invert the tortilla on to a large plate. Put a little more oil in the pan and slide the tortilla back in. Cook for 3-4 mins. Slide on to a plate to serve. Hint: if you are a bit apprehensive about inverting the tortilla on a plate and then sliding it back into the pan you can just brown the top of the tortilla under an overhead grill, let it cool a bit and then invert it on to a plate to serve. Soak breadcrumbs in the milk. Set aside. Mix pork mince, parsley and garlic together. Refrigerate. Heat the olive oil n a large, heavy based pan. Add the onions and cook until soft (about 5 mins). Add tomato paste and stir for 1 min. Sprinkle in the flour and cook for 1 min. Add wine and bay leaf, reduce to a low simmer. Add water and salt and pepper. Cook gently for 15 mins or until sauce has lightly thickened. At this stage you can sieve the sauce for a smoother result. I didn’t bother. Set sauce aside. Squeeze milk from breadcrumbs and add to meat mixture along with the egg and 2 tbs of the wine sauce. Season with salt and pepper. Mix well. Roll into small balls about the size of a golf ball. Dust with flour. Heat about 1 cm of sunflower oil in the bottom of a heavy based pan. Fry the meatballs until brown, turning occasionally and shaking the pan gently to make sure they aren’t sticking. Remove from pan and drain on a wire rack. Drain oil from pan, add wine sauce, stir. Add meatballs to sauce and simmer until meatballs are cooked through. Serve sprinkled with chopped parsley.